So back in October we screened Bronx Warriors and did a piece then, but there’s nothing wrong with giving this epic trilogy a bit more love, is there? I think not. Welcome to guilty pleasures. 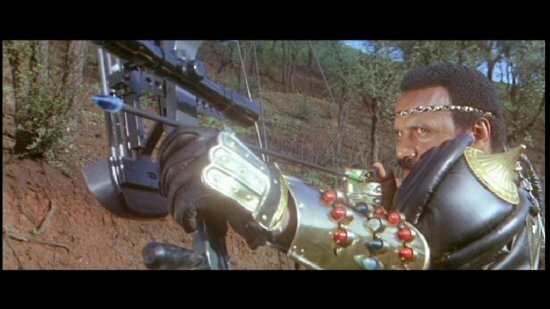 Or rather, welcome to Enzo Castellari’s low grade Warriors/Escape From New York mash-up/rip off, an inspired saga of post apocalyptic New York wasteland inhabited by violent rival street gangs. At first glance, appearing for all the world like yet another Italian cash-in on the bigger and more successful American films, these three flicks are surprisingly entertaining and enjoyable. While the acting and dialogue is on par with Cannibal Ferox for the idiotic and laughably quotable, you can see just why a certain Mr. Tarantino never shuts up about this trilogy or its lovable, cheery director. The very same chap who directed the original Inglorious Bastards back in 1978. He comes across as a thoroughly likeable guy on the DVD extras in which he runs us through the film’s development and legacy. Castellari remains passionate and proud of his films to this day. Unlike the previous low grade and deceivingly titled “Vault of Horror” Vipco “Churn ’em out” VHS releases, Shameless Screen Entertainment present these for what trashy fun that they are, who for starters aren’t advertising these films as anything other than the fun trash they are and have gone and put out a superb looking trilogy box set in a wonderfully skull embossed metal tin. The care and attention to detail that Shameless put into their DVD releases is a great way of introducing bizarre films such as these to an audience who would otherwise not know they existed. And as daft as this trilogy is (its pacing is at times uneven and makes no sense), it’s particularly hard to dislike, especially if you’re a fan of The Warriors, Mad Max or just post apocalypse films in general. There’s a tradition with most Sci-Fi films of this type, even with the more respected titles, of slapping a date on the film, in this case it’s 1990. Made during the golden period of Italian exploitation films and sharing more than just a passing resemblance to Lucio Fulci’s films of the early 80s, Castellari also shared producer, screen writer and apparently locations with Fulci, as there are several scenes set on the same Bronx harbour as the famous opening sequence to Fulci’s Zombie, and the twin towers crop up ominously in several shots. The story itself revolves around Anne (Stefania Girolami), a 17-year-old heiress to The Manhattan Corporation. Feeling guilty over having to inherit a morally questionable company on her 18th birthday, she flees into the lawless wasteland of The Bronx and seeks refuge with The Riders, a street gang, led by the charismatic Trash (Mark Gregory, who for some reason walks more like a horse than a man). Throw into the mix a Clockwork Orange-esque rival gang in clown paint, an insane ninja pony tailed George Eastman (of Absurd and Rabid Dogs fame) and a low key appearance from Vic Morrow as the renegade ex cop out on a manhunt and you have yourself an entertaining night of rock n roll urban hell. Though not anywhere as near as violent or brutal as you would think from the poster art or the time they were conceived, all three films pack quite a punch, and surprisingly, both sequels are fairly strong. The New Barbarians (part 2 or part 3? Different sources say different things) was shot the same year as the first film and is intentionally silly in comparison. Taking place in 2019 where laser guns and cyber-punks roam the desert wastelands chopping each other up and doing little else. Escape From The Bronx is similar in tone to the first instalment but flies along at high speed as Trash returns alone to stop the Bronx being torn down and turned into a high tech city of the future. Apparently, Castellari felt that Mark Gregory was a bit too pudgy by this point in his career, so asked him to keep his jacket on throughout filming. 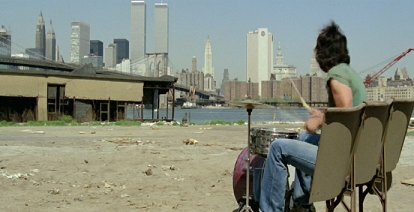 Though slightly more cynical and downbeat in tone, Escape From The Bronx is a great companion piece to the first film and stays truer to its origins than the more lightweight and sci-fi tinged New Barbarians. Sadly the glowing plastic skulls that adorn the gangs’ motorbikes from the first film don’t make a return. All in all solid trashy fun that, whilst not begging for THAT many repeated viewings, is a worthwhile addition to any respectable collection. Especially in this incarnation as it just looks great and feels all the more special for its almost unnecessarily deluxe treatment. Another classy job from Shameless Films. This entry was posted in GB, review, Stuff. Bookmark the permalink.